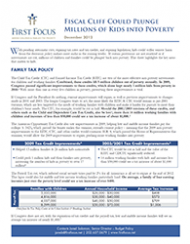 With pending automatic cuts, expiring tax rates and tax credits, and expiring legislation, kids could suffer serious harm from the decisions policy makers must make in the coming weeks. If certain provisions are not renewed or if investments are cut, millions of children and families could be plunged back into poverty. This sheet highlights the key areas that matter to kids.